There were 557 press releases posted in the last 24 hours and 153,509 in the last 365 days. 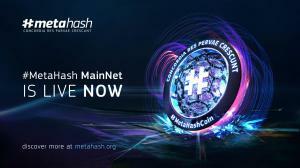 ZUG, SWITZERLAND, July 2, 2018 /EINPresswire.com/ -- On 29th of June, #MetaHash, a MultiPoS consensus blockchain and decentralized real-time application platform, opened its MainNet and started queue-based coin sale prior to its upcoming start of forging initiatives. The MainNet is preceded by months of load tests and a public TestNet, which showed results above declared capacity of more than 60,000 TPS, with under 3 seconds of validation through more than 500 billion transactions processed within the test phase. With the opening of the MainNet and start of #MetaHashCoin (#MHC) distribution, the first buyers will benefit from forging early, before the amount of forgers increases and forging rewards are split between more participants. Starting from 12:00 UTC on 29th of June #MHC can be bought via ETH or BTC, but at a price equal to $0.0391 converted at the exchange rate at the time of purchase. During the coin offering 920,000,000 coins will be distributed and the goal of the initial offering is set at $36 million. Owners of #MHC will become the first nodes contributing into the network’s growth and enjoying the full advantages of the early forging, scheduled for August this year. 50 percent of all rewards of forging are distributed among #MHC owners, 40 percent are granted to nodes’ owners and the remaining 10 percent are used to reward #MetaGate browser’s active users. Coin holders can also entrust their voting rights to their own nodes, or may give their voting right to a trusted node operator and get a share of the commission. This way, large numbers of votes are concentrated at nodes that the community trusts, making attacks on the system more difficult. To view the white paper and gather more information, please, visit https://metahash.org/.